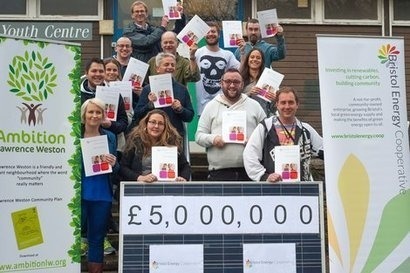 Bristol Energy Cooperative has built on a £600,000 fund-raise success with a new share and bond offer as part of its £5 million #OwnIt fundraise. This will help the coop to become a leader in the UK community-owned energy sector. The coop’s achievements have been considerable thus far and it has also been featured on the BBC as the kind of innovative, grassroots project that has helped Bristol to win the title of European Green Capital. Andy O’Brien talks to REM about how much investors can expect as a return, what the coop aims to achieve in the future as part of a wider effort to make Bristol into a Resilient City with real benefits for the community and for countering climate change, and just how damaging the recent Conservative government attack on the UK renewable energy sector has been. Tell me a little more about Bristol Energy Coop and what your aim is. We were established in 2011, and I was one of the founders. At the time I was involved in a sustainability group in my part of Bristol where I live. I got to know people in other parts of the city that were doing similar things. We decided to join forces so that we could pool resources and develop some larger renewable installations. The long term aim is to be able to develop energy efficiency projects as well. We developed a business model and have now launched two share offers which raised a quarter of a million pounds. We’ve used that money to install solar panels on six community buildings in the city. When we first started, we could just about do things using the free solar model, but then the Feed-in Tariff (FiT) rates dropped significantly and that changed our business model. We still provide installations for free where the building owners pay a subsidised amount for the actual amount of electricity they use from the solar panels, and then we use that money to cover all the project costs and maintain the panels over the 20 year period, insurance, maintenance etc and any excess spends are put towards community benefit. We have to be doing this at scale in order to provide a decent amount of community benefit but that’s without our current share offer. We are looking to provide a much bigger community benefit, which other groups and individuals across the city and across the region will be able to apply to and do their own projects. Our primary aim is to end up with a resilient city where people have access to low cost affordable energy, alleviating fuel poverty, that sort of thing. What do you think are the main benefits of community solar projects over, say, larger projects constructed by major companies? The main thing is if we can get lots of people involved, and that can include investing in the projects or helping us find new projects, working on them, marketing them, we can get a lot more people involved in the discussion on energy. I think there’s a bit of education that needs to be done generally, just to get more people energy aware. People don’t really think about it or really know the detail of what our current energy mix is or what we could do to change that and how much it would cost us and whether that would be good or bad. These energy projects give that lead in to that. People say “we’ve got solar panels going up on our roof. How much is that generating? What’s the benefit? Could we do it elsewhere? How much more would we need to make a difference? What other technologies could we use?” There’s a chance to talk about energy efficiency as well. So it brings in all those bits and pieces which, I suppose, your traditional larger scale energy developer wouldn’t do. A typical large energy developer installs a project and then goes on to the next one, and often sells it on anyway. Whereas we’re in it for the long-term, with the people we initially talked to, we’ll have that long-term relationship with them, where hopefully we can build on it and hope to do additional projects with them. Tell me a little more about the two solar farms you intend to construct? One of them is in Lawrence Weston, in the shadow of the Avonmouth wind turbines. That one isn’t under construction yet but we hope to start building that early next year if the fundraise is successful. The other one is very near Bridgwater. That one’s much more advanced, it’s pretty much built. How has the government’s recent attack on UK solar and renewable energy affected you? It’s had a very large effect on what we’re doing. With the projects in our current fundraise, the two solar farms and 20 more solar installations on community roofs, that whole portfolio of projects will cost just over £10 million to complete. Some of that money will come in from traditional bank loans and that will leave us with about £5.5 million to find from our share offer, and we’re just about to launch a parallel bond offer. These projects we’ve been able to pre-accredit or pre-register, depending on the size of the project, which we do with Ofgem, and that means we’ve been able to continue the FiT rate that was available on the date we submitted that registration. We know what those rates are going to be and we know they’re going to be index-linked for the next 20 years, so we can then go out to investors and say, as long as the sun shines, we are fairly confident of these projected returns on the projects and that helps us to give confidence to investors. If we were to do that with a whole new set of solar installations or solar farms next year, we just can’t do that. The government has taken away our ability, anyone’s ability, to pre-accredit a project. That means we don’t have any certainty at all on the FiT rate we’re going to get. How can we attract investors if we can’t tell them how much a project will make? We can’t explain the underlying financial model to them. That’s one thing. The other thing is, as things stand, the government is proposing to slash the Feed-in Tariff rates by an average of 87 percent. And that just kills the project dead. On that rate, the model just doesn’t stack up. It’s that serious. Can you see any way in which community projects can survive this? For example, is there any innovative financing model that can be drawn on so that these projects can survive? Well, what we’ve been saying, and I think this affects the whole UK solar industry as well as the community sector, is that we all know that the FiT rate needs to be reduced, and everybody accepts that, but what is being proposed here is, in effect, making the industry jump off a cliff edge. What we’re asking is that the FiT rate is reduced gradually, so that there is a plan which says, okay, over the next 2-3 or 5 years, the FiT rates are phased out in a gradual way and everybody can work to accommodate that. We’re already looking at using battery storage. That would be enormously beneficial in that we could be selling our electricity at a different time of day. That would make our business model much more effective, but I am not sure that kind of technology is with us right now…well, it is, but costs are still prohibitively expensive and so I think it’s about 2-3 years down the line when we would be doing it as default, whereas now it’s a bit of an early adopter. One other thing that may work is that right now our business model is based around the fact that we can provide subsidised green energy to people. It may be that we can’t subsidise it anymore, so that it will be the same price as energy from another supplier, who isn’t supplying renewable energy. In that sense, it’s less of a financial benefit, but the building users will still be reducing their carbon footprint. I think that will be part of the model in that it’s a slightly different narrative, we can’t sell the financial benefits quite as well but we can certainly sell the renewable benefits, and also the social benefits of everyone coming together and working on these things. The investors you’re attracting at the moment, what kind of financial returns can they expect? On the share offer we’re projecting 5 percent per year. So far, on the projects we’ve been running since 2012, those projects have all met their targeted returns. For the Bond offer, that’s a three year Bond where the interest will be rolled up and paid back with the capital at the end of the three years, so that’s compound interest, and that will be 6 percent on that Bond. If you compare that with what you’re getting from a building society or a bank at the moment, that’s an attractive rate of return and it show that these are good projects to be doing with a reliable source of income. Certainly, longer term, we want to be doing more of them and at larger scale and attracting investments from the pension funds. We’re already in discussion with quite a lot of large organisations and they are saying they would like to invest, but that they need the investment at a higher level, at £50 million rather than a million. So our challenge is to get to that scale where the sector can get to providing opportunities for that level of investment. That is a promising side of it really, there are lots of good things around if only it was given the breathing space to do them. What kind of benefits has the coop brought to Bristol in terms of promoting Bristol as a green city? As well as the projects we’ve been doing, for quite some time we’ve been involved in discussions around Zero Carbon Bristol and Zero Carbon Britain and what is technically possible and what is politically possible. We’ve been doing research on what other parts of the world have been doing on this, for example other communities that are making 100 percent renewable commitments or low carbon commitments. We want this area to be doing the same, so we’ve been holding a number of sessions on that and promoting debate around it. We’ve also been presenting the facts about fossil fuels. This goes back a little bit to what I was saying earlier about there being an education element to what we’re doing. I just think a lot of people, including a lot of our politicians, just know the basic facts around this. They really don’t know that subsidies for fossil fuels are much greater than subsidies for renewables and they don’t know that for us to keep the Earth’s global average temperature below 2°C, we need to keep most of the known fossil fuel reserves in the ground. My reason for saying that is that I’ve been talking to my own MP over the summer about these issues and he wasn’t aware of them. I’ve talked to another MP, rather than as an energy coop rather than a domestic resident, and that MP didn’t know either. It’s really key that we get that out, so in Bristol we’ve been doing a lot of work around the fossil fuel issue and we’re looking to hold a conference on this early next year where we just get loads of people around the table, and some of the decision makers and local financial institutions, and bring in experts who really know their stuff on this and say “Look – these are the facts. This is how it is!” Once we’ve got to that stage, we should really be pushing at an open door. If we find that door isn’t opening, then we’ll just have to keep on going and be quite firm about it that this stuff is just too important to ignore. We’ve got to move forward on this. That will probably be a large piece of work for us, but it’s something we’ve started, we’re working with lots of partners, lots of people in the Bristol region who are passionate about this but who also know a lot about it. Ultimately it’s also about all the benefits about this. Business gets it, communities get it and lots of governments around the world get it. There are financial benefits, look at all the big banks, Goldman Sachs, all the different research studies coming out. The costs of doing this are a lot better than the cost of not doing it, so there are financial benefits, the obvious environmental benefits and you’ve got the health benefits. The number of people who are dying of respiratory illnesses in the UK because of pollution is huge, it’s staggering! Then there are the social justice issues, the people who are in fuel poverty, who daren’t turn the heating on because it costs too much. It really is a no-brainer. We’ve just got to get on and sort it.